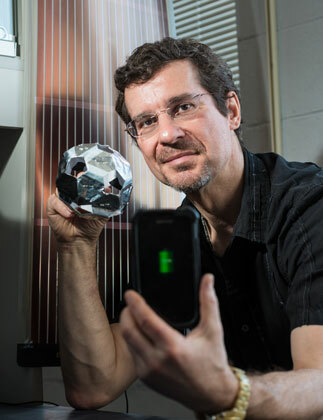 Thanks to a new finding by University of New Brunswick chemical engineering researcher and Richard J. Currie Chair in Nanotechnology, Felipe Chibante, solar energy could be produced much cheaper and with a smaller environmental footprint. A world-leader in nanotechnology, Dr. Chibante and his team of UNB students and staff have developed a method to produce a type of carbon used in solar cells for much less money than has been traditionally required. At roughly $15,000 per kilogram, Dr. Chibante says there was interest from industry and government to reduce the cost and environmental footprint of the carbon product called fullerenes. “The new process we’ve developed could reduce the cost of the highest priced component of carbon-based solar cells to less than $50 per kilogram,” said Dr. Chibante. The idea for this new process came to Dr. Chibante while reviewing old chemistry journal articles from the 1990’s. He realized more heat was needed to create a larger reaction, so they simulated the heat of the sun. “It’s a three-phase arc that allows us to enlarge the plasma with relatively small amounts of current. It gives us temperatures roughly equivalent to the surface of the sun,” said Chibante. Traditionally performed using a $50,000 piece of equipment, the UNB team built a similar device using a few tools purchased at a local hardware store. They managed to create a reaction that reached a temperature of approximately 5,000 degrees Celsius—with the touch of a button. “By simulating the heat of the sun we are able to convert light to energy much more efficiently and affordably, with less pollution than traditional methods of producing fullerenes,” said Dr. Chibante. Chibante said he doesn’t believe the carbon-based, thin-film solar cells will displace the silicon-based cells because they capture less energy. But he does see a future for the more flexible sheets of solar cells. A serial entrepreneur before entering academia, Dr. Chibante sees solar-powered house paint, clothing and ink being commercially available to the public for a reasonable price in the not-so-distant future. Dr. Chibante is currently working with UNB’s Office of Research Services to get a patent. His next step will be to seek industry partners to bring his research out of the lab and into the world.